This adventure was created as a one-shot scenario with pre-generated characters for ConGames 2000, a gaming convention held on the weekend of July 22nd and 23rd, 2000 in Tampa, Florida, by the Stonehill Gaming Association. Rather than creating a big, epic quest, I opted to just take some of the information presented in the Wasted West supplement, and turn it into an adventure, fleshing it out a bit -- much the same thing I did with the Attack of the Killer Potatoes adventure, built from the "New Jerome" snippets in Road Warriors. First off, this may stretch credibility a bit, making the S-Mart Overlord a little more accessible than he ought to be to a bunch of almost beginner-level heroes. This was for the sake of a one-shot adventure. To properly incorporate this into an on-going campaign might require a bit more fleshing out than what is presented here -- and more work on the part of the Posse. Hopefully this is a good starting point, though. Statistics are not included here for the Warmongers and the S-Mart Overlord himself. For those, check out the Wasted West supplement for Deadlands: Hell on Earth. The S-Mart Overlord is a Servitor of War who was once a wrestling star before the bombs dropped. He is now a tyrant in charge of a small army of thugs who support his little "empire" by going out and demanding tribute from less well-equipped settlements radiating outward from his central base. The Overlord happens to enjoy watching brutal combat in an arena in his base. Toward that end, his minions have taken five prisoners from a nearby settlement, and plan to toss them into the fighting pit, one every two hours, on the Overlord's birthday, starting at sundown. The Posse happens to learn of this plan with very little time to spare. The heroes arrive on the outskirts of the S-Mart Overlord's ruined compound on the same day that the slaughter is supposed to begin. Their mission is to rescue as many of the prisoners as they can. It would be an added bonus if they can somehow do away with the S-Mart Overlord as well, but that may be asking a bit too much, as he is highly regarded to be an immortal. The pre-generated characters presented for the Posse are based off of several archetypes from the books, though they've been "enhanced" in different ways (given additional skills to make them stand out in different areas) and in some cases simplified (such as the cyborg) for the sake of a one-shot convention game. The following is a quick summary of the different pre-generated characters, with links to more detailed statistics. Here is also a copy of the quick summary section, meant as a hand-out for the players to examine, so they can decide which characters to play. Ideally, the group should at least include either the Junker, the Cyborg, the Toxic Shaman, or the Doomsayer, so that they have a chance of making use of the APC to assist in the escape of the prisoners. The Syker, Witch, or Wolfling would be very useful if the Posse wants to stealthily deal with rescuing the prisoners. The Anti-Templar, Pit Fighter, and Soldier have their own useful skills, but are mostly included in order to satisfy fighter types. Paladin-type. The Templars were formed as a group of heroes to help the survivor settlements of the Wasted West. However, their methods in determining the "worthiness" of such settlements to receive help have been controversial, to say the least. This hero is a member of a counter-movement, the Anti-Templars, who seek to help everyone, without worrying about who is "worthy" of help. Still, the source of the power the Anti-Templars use is in question, and many of them seem to slip down the path to corruption. This Anti-Templar is a knight in tarnished armor, proficient in close combat, and able to use supernatural powers to heal wounds on himself and others. "Robot" warrior. Automatons and robots in the Deadlands universe aren't true "robots". They're motivated by the artificially reanimated brain matter of deceased people, combined with so-called "AI" co-processor units. This "robot" is a combat drone that was serving the Confederacy before the bombs dropped, as a close combat specialist. The war is over, the commanders have been vaporized, but there are many cyborgs wandering the wastes, still obeying the "programming" they were given years before. This is one such cyborg, trying to do heroic deeds, but still confined by the orders of its "AI" and old, programmed directives. Radiation priest. Capable of unleashing the "power of the Glow" on the "unbelievers" in the form of Atomic Blasts and "Nuke", though limited in the amount of Strain he can withstand before he has to rest and "recharge" again. Also has some other interesting abilities, such as "Power-Up", which allows him to power electrical devices for a limited amount of time. Tech wizard. Able to design and build wondrous contraptions that push the boundaries of what should be possible with the laws of physics as we understand them. Although the designing and building of new gadgets is beyond the scope of this adventure, she comes equipped with a rocket pack, and could be useful whenever a technician is required. Gunfighter. Formerly a "Black Hat" -- one of the reviled footsoldiers of the evil Combine -- but he's turned over a new leaf, traveling the Wasted West in hopes of bringing a little law and order to the survivor settlements. Basic fighter type, good with a pistol. Commanding presence, with decent people skills. Melee Specialist. Big, muscle-bound ... and none too bright. This is a warrior raised to entertain spectators by bashing in the skulls of monsters and fellow pit fighters. Not very good at "people skills", but good at hacking things with his battle axe. Heavy fire support. Old soldier, veteran of the Confederate Army from the Last War, now a mercenary relying on his grenade launcher and assault rifle to clear out enemies. Fairly well armored and suited for combat. Mentalist. Genetically engineered user of psychic powers, able to fire bursts of mental energy, to make himself "invisible" or to take on the appearance of other people, and even to heal his own body with the power of mind over matter. Specialist in covert operations: stealth, climbing, picking locks, etc., weak in armor and combat. Spellcaster. A descendant of the shamans of old who communed with nature spirits, but many nature spirits have been corrupted by the devastation of the Earth. The Toxic Shaman communes with warped spirits, trying to use the powers they give him for the serving of good, but his "allies" are insane and often cruel. Capable of healing wounds, lobbing blasts of radiation, and of taking on an "energy form" and passing through solid objects. Potion-maker. No relation to the Raven of legend. Able to make special "witch brews" to heal wounds, etc., given the proper components and enough time to work with. Most of that is beyond the scope of this adventure, but she has some combat ability in the form of being able to throw charged-up marbles as "Eldritch Fire" as an attack, and she has a shotgun. Otherwise, she has the ability to heal wounds, speak to animals, and create a temporary personal "shield" against attacks. Moderate in combat ability, strong in people skills. A wolf-man monster, once a prisoner of the S-Mart Overlord, and forced to fight in his arena. Very incompetent when it comes to using items of technology, and has trouble fitting in with people, but capable at tracking and stealth, and also pretty good at unarmed combat with natural weapons of tooth and claw. The following is some introductory material for the players, assuming that they don't have much prior experience with the Deadlands universe. It is the year 2097, thirteen years after the ghost rock bombs were dropped on every city worth putting on a map around the world. It's hard to say what exactly triggered this event, what could have possessed the leaders of the world to go after each others' throats and to bring about the end of the world like this, but the blame is often put on a material known as Ghost Rock, which appeared back toward the end of the 19th century, as the Civil War dragged on. Earthquakes split California, creating broken mesas and waterways that formed what people came to call the Maze ... and the broken rock exposed veins of a previously unknown black mineral that was at first mistaken for coal, but which burns with far greater potency, and made possible wondrous contraptions previously relegated to the realm of early Jules-Verne-esque science fiction. It was heralded as the key to a new age for science ... but there was something strange about how the mineral seemed to let off a sound like screaming voices when it burned, and how, if you looked just right, the smoke seemed to form twisted and tormented ghostly faces. Those of a scientific mind scoffed at such notions. And, of course, something this impressive had to be fought over. The Civil War dragged on for far longer than it ought to have, and many other nations got in on the action, fighting over parts of the Maze. For a time, things calmed down, in the 20th century ... but in the 21st century, it was discovered that a special process of exposing ghost rock to high doses of radiation released even more impressive amounts of energy. And then, the famous scientist Dr. Hellstromme developed the ultimate device of mass destruction ... it had much the effect of a neutron bomb, able to kill living creatures and leave structures intact, only it had even less of an impact on the environment, and background radiation, according to tests, would diminish within ten years, making the area inhabitable again. The prospect of world war didn't seem so devastating anymore, perhaps ... and the conflicts over the supplies of ghost rock flared up anew. Finally, things got so mad that nations started lobbing ghost rock bombs (and more conventional nuclear weapons) at each other ... and the ghost rock bombs weren't as "harmless to the environment" as Hellstromme's test results claimed. Thirteen years after the bombs dropped, and there's no sign of the cities becoming habitable again. The east coast of the States was so badly mangled that no one dares go there. The wide open expanses of the West, however, allowed a few areas to be spared from the worst of the devastation, though trying to survive in what's left isn't exactly a walk in the park, either. Creatures have been heavily mutated by the strange radiation of ghost rock, and many people have been so grotesquely transformed that they can hardly pass for human anymore. What's worse is that some claim that the millions of dead in the cities have risen, and march the earth, hungry for human flesh. If tales are to be believed, this isn't just some apocalyptic wasteland -- the Four Horsemen of the Apocalypse themselves have been sighted stomping across the West (and presumably the rest of the world), and horrors of ancient legend have come to life (or unlife). On the positive side, though, there are some who claim supernatural powers who happen to be on the side of what's left of humanity. Something about the devastation of the Earth must have somehow broken the walls between the mundane world and the spirit world, as -- as some would tell it -- magic has come back to the world. Some say it has been around for even longer than that. Now, a Posse of heroes travels across the Wasted West, seeking to right wrongs, or perhaps just to scrape out a living by killing monsters and getting paid for it ... each according to their own motivations. This particular Posse hasn't been together for very long -- They each answered a call for help from a survivor settlement by the name of New Jonesboro that has been plagued by road gangs demanding "tribute" for their "overlord" ... and like most settlements, they really haven't all that much to spare, especially if they're to survive the winter with any food stores left. What's worse, the Overlord took five prisoners from their camp, with the intent of sticking them into his arena to entertain him as they fight (vainly) for their lives. The Overlord's birthday is coming up, and at sunset, his goons are supposed to start tossing prisoners into the arena, one every two hours, until they run out. The settlement has scrounged together a collection of $5,000 worth of bullets, rations, and tradeable goods, as a bounty to be split up amongst all surviving members of the Posse, provided they can rescue all ten prisoners. Short of that, they'll pay $1,000 bounty per prisoner released. They also have another $5,000 bounty for whomever can bring back the head of the S-Mart Overlord, but that's admittedly pretty ambitious ... and, frankly, given the choice of the two, they'd rather get their kin back first, then worry about dealing with the Overlord later. According to what the Posse has been told of this S-Mart Overlord, he was once a World Wrestling Federation Champion known as "The Overlord", famed and best known for the iron mask he always wore. When the bombs dropped, survivors across the world looted what they could. Department stores such as the S-Mart chain were prime targets, since they stocked just about everything from hunting gear to camping equipment to spare parts for cars and even snacks and sometimes groceries at the "Super S-Mart" stores. At one of the Super S-Mart centers, the security guards had their hands full trying to fend off looters ... until the Overlord and a number of hangers-on arrived. At first, it looked like the Overlord was coming to their rescue, and many rallied to his cause simply because of his fame. Once he drove off the other looters, however, he put himself in charge ... and any of the security guards who didn't agree were quickly dealt with. Most of them, of course, fell into line. Over the years, the S-Mart Overlord has established himself as a warlord commanding countless thugs and road gangs who head out and demand "tribute" from surrounding survivor settlements. Any who don't comply are harshly dealt with, either killed on the spot, or dragged off to the Overlord's main base, where they entertain him by fighting and dying in a blood-sport arena, either going up against "gladiators" in his service, other captives, or the occasional captured monster. Some say that the S-Mart Overlord has become something other than human, that his craving for blood and violence has transformed him ... or that he has made some sort of a pact with dark forces. It is widely claimed that he never sleeps, and continually demands to be entertained by blood sports in his arena, when he is not out leading attacks on reluctant settlements, or fighting off anyone bold enough to challenge him to a duel in the arena. (Of course, such duels are always to the death, and obviously so far he hasn't lost yet.) It is also claimed that he has survived repeated attempts to poison, infect, snipe or back-stab him, and that it's pretty hard to get to him through his retinue of bodyguards and lackeys. For various reasons, the heroes comprising the Posse have agreed to take on this cause, and rather than heading after the bounty their separate ways, have joined forces -- at least temporarily -- to try to do something about this powerful enemy. One of the central motivating factors in this adventure is that there is very little time to work with. In real time, this adventure was designed to be run in a four hour time slot, with the "winner" of that event being the player who had acquired the most Fate Chips through role-play and other bonuses. In game time, the Posse has only six hours until prisoners start getting mauled in the arena. After that, they still have time to be at least partially successful in rescuing them, but the longer they take, the more people die. One problem for the Posse is that they'll have to ideally work in broad daylight if they want to save everyone. If they want to wait until sundown, they can only do so at the cost of lives (and bounty for rescuing prisoners). So, something better than just "rush in with guns blazing" or "sneak around in shadows" is called for. Hopefully, this will be a chance for the Posse to get creative. Every 2 hours, starting at sundown, a prisoner will be stuck in the arena, and will last for about 30 minutes before getting killed. If any members of the Posse are watching, then the Marshal may opt to play out the combat, but otherwise just use this schedule as a guideline. It needn't be stuck to rigidly -- The Posse may take actions, after all, with the intent to delay the proceedings. If they do so, they should be rewarded for their efforts. When the adventure starts, it is noon, and sunset will be at 6 pm. It will take two hours to travel by foot from the Rad Rat encounter to the S-Mart base, so that only gives the Posse about four hours of in-game time to deal with obstacles along the way and prepare for the showdown at the arena. This adventure was designed to be played out with miniatures on a 4' x 4' board of fixed "urban ruins" terrain, with smaller areas to be used to represent various locations. The board would be reused for two main "encounter areas" in the ruined town that the Posse would travel through. The first would be their encounter with the giant rats, and possible scavenging opportunities. The second would be the S-Mart base and surrounding areas. The adventure is designed to be run in four hours at a gaming convention -- If it seems that an undue amount of time is being spent just getting the players acquainted with the game (i.e., more than an hour), then it may be best to skip the "giant rat" encounter. Of course, it's conceivable that the Posse could wander off in different directions to explore the city. That will have to rely on Marshal ingenuity. For the sake of brevity, this adventure makes a lot of assumptions about the actions of the Posse, the first of which being that they'll attempt to actually accomplish the mission. The original "play area" consisted of a wooden board with buildings attached to it, with gaps between them to indicate the presence of one north/south street, and another east/west street, each street stretching across the play area and intersecting in the southeast quadrant. This irregular placement of the intersection makes an especially large block in the northwest corner. In the first Scene, this is just a generic building. 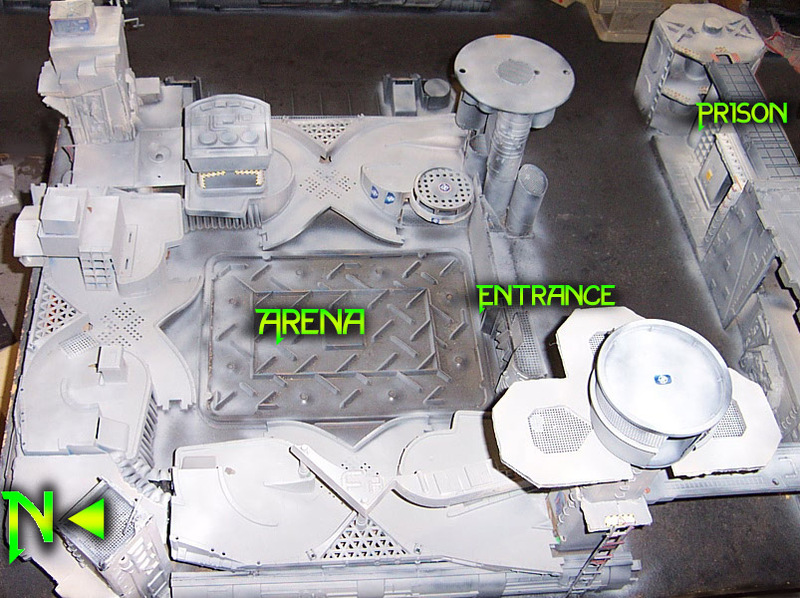 In the second Scene, this is the S-Mart Overlord's base and fighting arena. The "front door" leads straight to a drop-off that dumps the unwary entrant into the basement of the building -- the arena. Given the ruined state of the building, there are several other possible entrances, all of them preferable to the direct approach. The southwest corner has a facade that represents another building. In the second Scene, this is the holding area for the prisoners, with a bridge that crosses the street. The prisoners are taken across the bridge to the building, then taken inside and to the arena, getting a somewhat shorter drop to the arena floor. The northeast and southeast corners are yet more "ruined buildings", of no special import. Inspired by a certain first-person-perspective three-dimensional shooting game, there were several barrels of explosive toxic waste that I had lying about for no apparent reason other than to be blown up with errant gunfire. 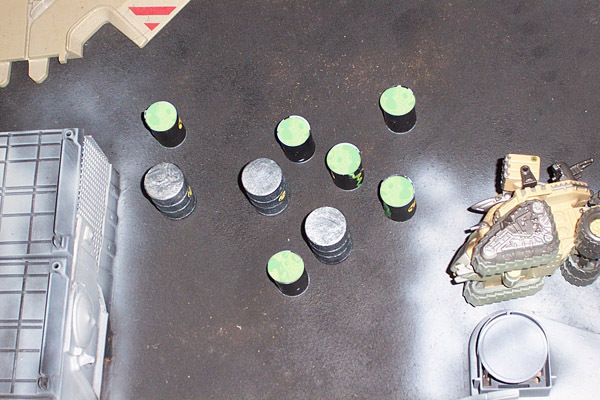 Miniatures-wise, these can be represented various ways, but my favorite was to get some wooden craft "oil drums" from a craft store, base coat them black, dry-brush them silver, then paint radiation warning symbols on the side. A bit of fluorescent green paint here and there to simulate "leakage", and some rust spots add the perfect finishing touches. Ideally, these barrels should be large enough to stand on. If you can't find the wooden "oil drums", then thread spools and any number of other small, cylindrical objects can fit the bill. Doom barrels can be useful either to stand on and hop across, or else to hit with a well-placed projectile to explode and quickly clear the area of pests. Treat doom barrels as if they are Size 6, and the barrel itself has an armor rating of AV 1. Any hit capable of causing at least one light wound is going to puncture the barrel, and start a leak. These toxic chemicals have undergone radical chemical changes over the past thirteen years, and now, as soon as they are exposed to air, they explode violently. Fortunately, those barrels still left are fairly sturdy, so a casual bump won't cause them to break, but anything that can break the barrel will cause it to go off. When a doom barrel explodes, it causes an explosion with damage 6d6 with a burst radius of 5. This counts as massive damage, so in order for this to cause a secondary explosion in other barrels within the blast radius, it has to cause two wounds against any other barrel. (The first wound is negated by armor.) Any characters who have resistance to radiation, fire or sludge (i.e., a Sludge Shaman's Resistance) may apply this to any damage suffered from the blast. The purpose of the first "encounter" is basically a chance for the Posse to get a feel for combat, against foes that they should ideally be more than a match for: a swarm of Giant Rats, numbering two per Posse member. When the Posse arrives, there should be one or two rats visible, and anyone who cares to observe can notice that there are signs of activity that indicate that there are more in the area. If the Posse heads on up to the intersection, the others will come out of hiding and attack. Don't bother rolling for surprise on the part of the rats -- They make enough noise that the Posse should not be caught off guard. However, it is conceivable that, if the Posse is particularly stealthy, they could make a sneak attack on the rats (at least, those visible). Another possibility of dealing with the rats is to climb up on a nearby building, and take pot shots at the rats from an elevated position. They can hop on top of the doom barrels, but they can't clamber up walls very well. Also, a means of evading the rats could be to hop across the tops of the doom barrels to cross the street -- While the rats are capable of climbing up onto a barrel, there isn't enough room for them to do so while someone else is already there, and it's a fairly simple matter for someone to kick off a rat that tries (i.e., the character doesn't have to spend an action to do so). 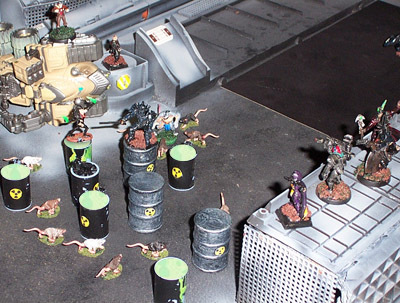 Another option would be to trigger the barrels while the rats are near it (and the Posse is not) with a ranged attack. If the Junker, Toxic Shaman, Cyborg or Doomsayer are in the group, they should be able to identify the properties of the barrels on a Cognition check against a TN of 5. Anyone else can guess at the properties of the barrels against a TN of 7. If the Witch is in the party, she could get the idea of using Speak With Animals to deal with the rats. This can only be done if the Witch is sent up to deal with them before the whole group marches up and combat breaks out. The Junker could try to scare the rats by flying low over them and using the rocket pack to spook them. (Of course, a grenade could do the trick, too.) The Cyborg could just wade into the midst of them, pretty much impervious to getting chewed on, and either scare off the rats, or serve as a decoy while the others sneak past. Yet another possibility would be to try to find a way around the intersection, through nearby decrepit buildings, and just move on. If the Posse thinks of doing that, they can bypass the encounter entirely, and move on to the next scene. However the group deals with the rats, give them a white chip each for getting past the hazard. (If, for some reason, it seems that the Posse suffered a lot whle trying to get through this encounter, make it a red chip each instead. Just don't let them know that you're increasing the reward because they took a lickin'!) If any particular Posse members were instrumental in dealing with the situation (such as by acting as a decoy, coming up with a peaceful resolution, or coming up with an idea to help in the situation -- even if someone else actually implements it), be sure to give out an extra white chip to whoever deserves it. Should the Posse succeed in killing or driving off the frenzied giant rats, they may opt to search the surrounding area. Nearby, there is a body of one of the soldiers from the disabled vehicle, who can be found if the Posse does a general Search of the area and makes a TN of 5 or better, or else if someone actually decides to look in that specific area. The body has a torn-up uniform and environmental suit. The suit is full of holes and would require considerable patching (i.e., it's not worth much, and nothing for the scope of this adventure). Someone can do a scroungin' roll to see if anything valuable can be salvaged. TN 7 -- Half-buried under some nearby junk is a first aid kit. It gives +2 to any healing rolls for the length of the scenario. If anyone investigates the vehicle, it is electrically powered and significantly armored. It was taken out by an EMP burst. A tinkerin' roll against a TN of 11 can be made to get the vehicle working again by bypassing damaged systems, etc. The Cyborg and the Junker get +4 to their rolls to attempt this. The Toxic Shaman can "reverse-cast" Pulse (for 1 Strain point) to fix the problem. The Doomsayer can use Powerup to get the machine moving. 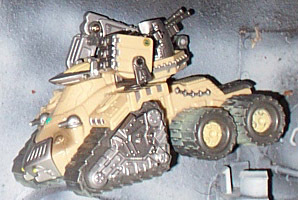 The vehicle has no mounted weapons, and has damaged tracks that can't be fixed with the tools available. In other words, it can be used to drive from Point A to Point B (or, in this case, Scene 1 to Scene 2), but it can't be used to bulldoze through barricades. Treat it as having an AV of 4, but otherwise having statistics like a pickup truck. If the Posse takes it along, they can get to the S-Mart Overlord's base in a half hour instead of two hours, which may buy them some extra time, unless it took them very long to get the machine working. The vehicle's controls are simple enough that anyone in the Posse can drive it along, but if the Posse wishes to use it in combat, "Drivin': Tracked" is required ... which, incidentally, nobody has. It's up to the Marshal how much of a break he wants to give to the Posse if they want to try using the vehicle to run down thugs or evade gunfire. Deadlands, Deadlands: Hell on Earth and Deadlands: The Weird West and characters and features thereof are trademarks of Pinnacle Games, and their use here does not constitute a challenge of trademark status. This site is by no means official, and should not be considered representative of the quality of the products of Pinnacle Games. With the exception of the "Deadlands" logo, and except where otherwise noted, all artwork and all articles on this page are (c) by T. Jordan "Greywolf" Peacock, and may not be reproduced without permission.